Despite low birth rates - Manufacturing in Singapore and interesting jobs are in sight. A positive sign has emerged and great opportunities to increase productivity in Singapore with less cost, but yet creating high skilled job functions - its on the way – don’t miss the boat. A hot topic in recent time has been the high increase of migrants and temporary workers and the even more crowded streets and roads on the small place of Singapore. This can be a dilemma because Singapore also needs more and bigger business to keep the universal wheel turning at a pace that does not create stress because among many other important parameters such as happy family - an interesting and satisfying job without stress is also a key component for how life flows in a positive way so it not becomes stagnant. So instead of just seeing the outside world pass by from a crowed street or small flat there is a way to achieve god balance. Singapore has many opportunities to ensure such god balance of increased competitiveness with high skilled jobs and be a centre of competence and be a highly efficient production house because the foundation is already here with some many top class education institutions and a very friendly business environment for companies all the way from small SMEs to big corporations. Since Singapore already create so many highly competent young people with great skills from educational institutions there is already a strong foundation to also keep the manufacturing and production in Singapore. By nature there is a need for goods anywhere in the world – also in Singapore and with the high pressure on the environment the future might need to ensure the production can take place near the point of consumption. Traditionally production has been associated with the need for low skilled workers and many of them – maybe not so much any more because in recent years new and very smart universal industrial robots are available. Singapore can embrace these new universal robots because they can be the key to first of all make jobs much more interesting because instead of previously needing low skilled workers now we need high skilled robot administrators and commissioners. With the emergence of new robot technologies the programming of robots has become intuitive and much more accessible and interesting to work with – it is fun and mind boggling because it speaks too many of human skills and it speaks to our creativity so this is very interesting because working with such robot creates even more ideas for increased productivity. Robots does not take jobs away – they create more and better jobs and Singapore can gain a great competence and competitive edge by utilizing these new universal robots for production in Singapore. And over time Singapore can provide its expertise from such competence to endless other parts of the world that also needs to be able to produce at home and near the place of consumption. Not only is this a good opportunity for the new young Singapore professionals, but also a great plan for experienced citizens who have many years experience in the Singapore production life – and a good and interesting job for mature citizens is a very good retirement plan. So if you are a Singapore production manager or owner – or plan to start a production – or thinking of outsourcing the production – then think again and see the great opportunities in Singapore. 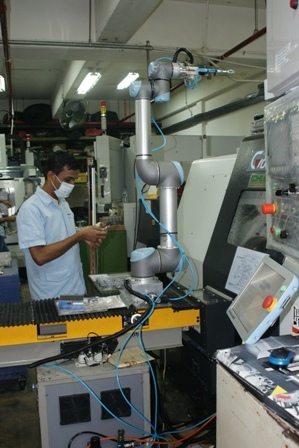 Buy a robot arm so you can be independent and keep production in Singapore – buy a robot arm - it is easy to utilize a robot arm. So secure your production flow and make sure you can put the quality stamp on your product as “Made in Singapore”. Already surveys in Europe shows that companies regret out sourcing and at many places in the world we until now have considered low cost area is now reaching the Levis Point which mean the cost, of taking current production down at home and moving to set up new production far away from point of idea and consumption, is reaching an amount that is higher than keeping the production at home. Now instead manufactures can produce more by introducing the latest technology in automation and robotics. Operators become partners of Robots and release them from the mundane work and upgrade the people to robot trainers or robot administrators or robot team managers and now they have a job that is better than before. Robots are lifting the atmosphere at the work place. Good automation brings consistency – no stops – uninterrupted production flow. Some positive experience is that many continuous tasks are much faster to complete – there is no interruptions for breaks – phone calls – other instructions or normal small talk. When first automation is set in motion it continues and complete much faster. 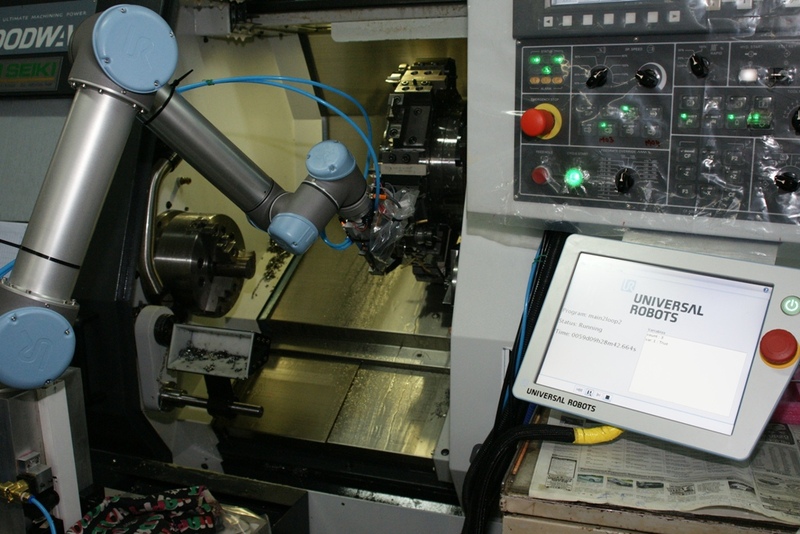 In many case other process machines like CNC and Injection Moulding machine or similar machines does actually not work to capacity because of unnecessary waiting time to be reloaded while the operator is busy tending another machine – a robot will tend right away. Some companies who cleverly have introduced robotics to reduce their operational costs – suddenly get a positive surprise that they also could produce 3-4 times more then previously because of optimized cycle time for the work piece. So this is a hidden benefit – not only will a robot help to increase your productivity by providing a constant - uninterrupted and consistent work flow, but it will also contribute to full capacity on associated machinery. This means implementing robots is not just one cost reducing component, but typical several cost reducing components - and for sure several components of increased productivity. With a Universal-Robot arm there is no need for specialized software programmers and is easy to implement. 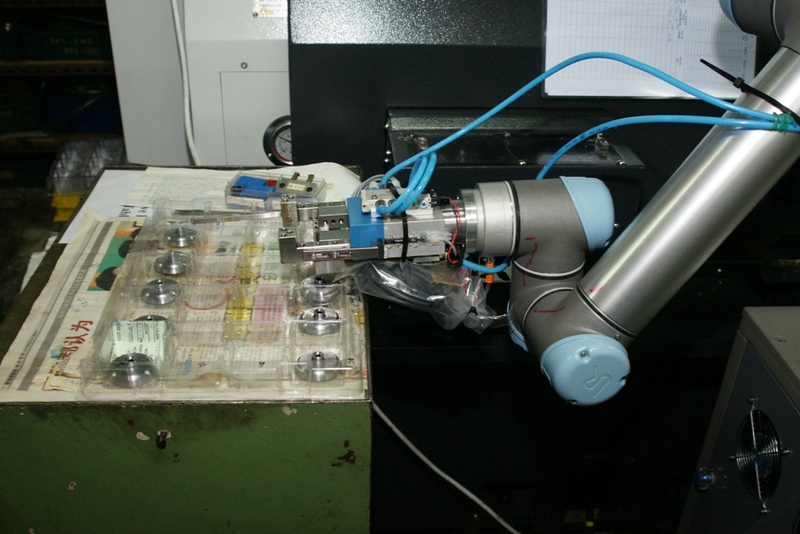 Universal-Robot has a collaboration function which makes the robot stop if it hit an unexpected force. A thorough risk assessment must however always be made. And the robot hand (often also called end effectors) which typically needs to be customized to be able to handle a particular work piece can very often be put together from very simple grippers and modular building sets. Such robot end effectors can in many case be air chuck for open and close grippers or electrical gripper which also has open and close functions or Vacuum pads and many creative modular building blocks are available for such purpose. So from getting the robot into the workshop or production facility to action can be done in matter of hours or even minutes in some cases.